NO SHOW HERE, but go see ICP Orchestra at Oglethorpe University. They're incredible! A perfect evening for lovers of art, style, Shel Silverstein, and those who are still children at heart. 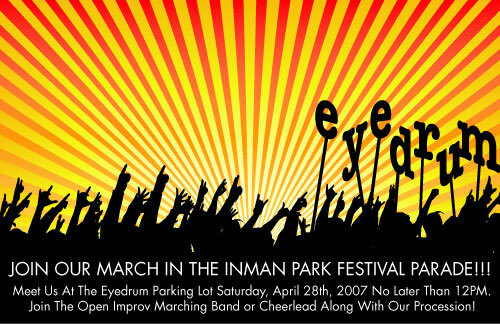 Atlanta, GA � On Tuesday, April 24th, Eyedrum presents an unusual round of performances, featuring readings by best-selling author T Cooper (Lipshitz Six, or Two Angry Blonds, Some of the Parts), music from solo artist and Indigo Girl Amy Ray, and a sneak preview of new solo theater by transgender performer Scott Turner Schofield. All three artists will present work as yet unseen by Atlanta audiences, riffing in-the-round on gender, growing up, and pop culture. The all-ages program begins at 8 p.m., and will also feature guest performances by Three5Human, and the Athens Boys Choir. Cooper will read from Lipshitz Six, or Two Angry Blondes, a Los Angeles Times bestseller called "A glorious identity-bending, multigenerational epic" by Time Out New York, newly released in paperback (Plume). "This is not another generic everyday family saga," reviewed the Seattle Post-Intelligencer, "not when it starts in the Russian pogroms, jogs past Charles Lindbergh, and closes with a guy who impersonates rapper Eminem at bar mitzvahs." The 2003 Lambda Literary Award finalist in the transgender category is also co-editor of a politically-minded anthology of stories entitled A Fictional History of the United States with Huge Chunks Missing (2006). 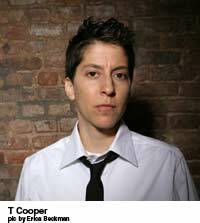 T was also a member of the world-famous Backdoor Boys drag king troupe, and sojourns to Atlanta from the East Village of Manhattan. Home-boy Schofield, back in Atlanta fresh from a spring tour that included a stints at The Playwrights' Center in Minneapolis and Yale University, will offer a peek at the anticipated hero myth/sit-com/solo performance that will premier at 7 Stages in Atlanta in January 2008. A Choose-Your-Own-Adventure storytelling epic complete with fort and decoder ring, �Becoming a Man in 127 EASY Steps� was commissioned by the National Performance Network, making Schofield the first openly transgender artist to be commissioned by the institution. 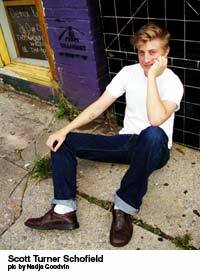 Ray will present hits from the recent solo record Prom (Daemon Records), which explores the dance between gender and sexuality, and authority and rebellion in the suburban and rural South, taking aim at destructive value systems from high school to the punk scene. 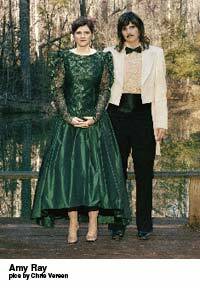 The proud founder of Southern indie label Daemon Records will play acoustic favorites from the 2001 solo release Stag (also Daemon), as well as secret tracks from an unreleased third solo effort. Ray's musicianship rocks through genre, scene, and identity, claiming rock, old-school punk, and folk as fenceless ground all her own. Ray's solo talents on April 24th turn an evening of live words into a night of rock'n'roll. Eyedrum is located at 290 MLK Jr. Dr., Suite 8, Atlanta, GA 30312, close to Oakland Cemetery and the Mattress Factory Lofts. Free parking is available, and MARTA's King Memorial Station is just 4 blocks away. For more information on this event, please check out daemonrecords.com and undergroundtransit.com. *That would be The L Word, featuring "Some of *Her* Parts" penned by lead character Jenny. 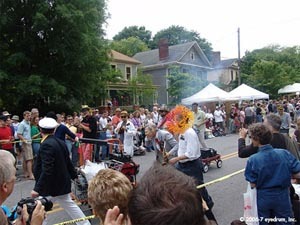 The Inman Park Parade will make its annual roll through the streets of Inman Park at 2:00 p.m. on Saturday, April 28, 2007. 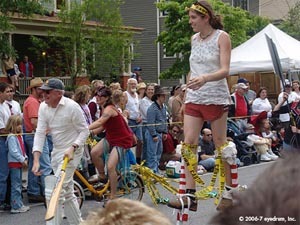 Now in its 36th year, the parade is Atlanta�s quirkiest and most colorful parade, led by the Inman Park Butterfly, followed by floats, bands, art cars, politicians, drill teams, mascots, Kelly�s Seed and Feed Marching Abominables, clowns, jugglers, and many more, closed by the Inman Park Trash Queen, riding aloft a city street sweeper. And of course, us, you and whomever else we can conscript into duty. The parade begins on Edgewood Avenue at Spruce Street, follows Edgewood to Hurt Street, Hurt Street to Euclid Avenue and Euclid Avenue to Moreland Avenue where it disbands. The approximate length is 1 mile. There are approximately 75 units in the parade and admission is free. If you would like to join us and/or our Open Improv Marching Band meet at the Eyedrum parking lot no later than 12:00 noon, as we need to tow our massed array to the staging area on Edgewood Avenue between Krog and Spruce by 12:30 PM for check in. 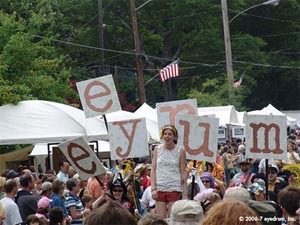 If you arrive late to eyedrum or the festival, then join us en route and step in line with the eyedrum juggernaut as we march, crawl, hop, or cruise the parade route. Come dressed in whatever fashion or unfashion you choose. Bring your instrument(s) and prepare to make some noise to be conducted by the Open Improv Marching Band Leader Robert Cheatham. We will attempt to have ready refreshments on hand to keep everyone cool and spirited. If you would like to contribute we will love you forever. 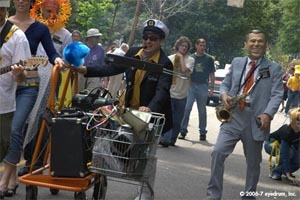 This year�s 2nd annual eyedrum procession will feature a float pulled by a vehicle! No more schlepping 300 lbs. of equipment in a shopping cart this year. More information to come if a time to participate in the decoration of the eyedrum float will be announced to our patrons. Do you need more deets? Would you like to volunteer to help, support and participate in this event? Email volunteer@eyedrum.org to enlist your valuable services. Darfur Diaries and performances from local musical artists.